You’ve worked hard all your life. The one thing you’ve looked forward to is that day you could hit the road and travel with the wind. There is one tiny little concern that may be bothering you… How do you maneuver a vehicle that’s practically as big as a house?! The largest thing you’ve ever driven was a string of sub-compact cars that provided cheap, yet reliable, transportation for your commute to and from the suburbs. The thought of piloting a 38-foot long, 8-1/2 foot wide behemoth through the narrow streets of a city is a terrifying prospect, to say the least. And the notion of directing something that large down the freeway at 70mph seems more like navigating a run-away train that could easily destroy everything in its path. Should you give up your dream of traveling in luxury and stick with the motel routine? 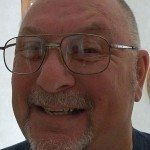 Or is there hope for the first time motorhome driver? 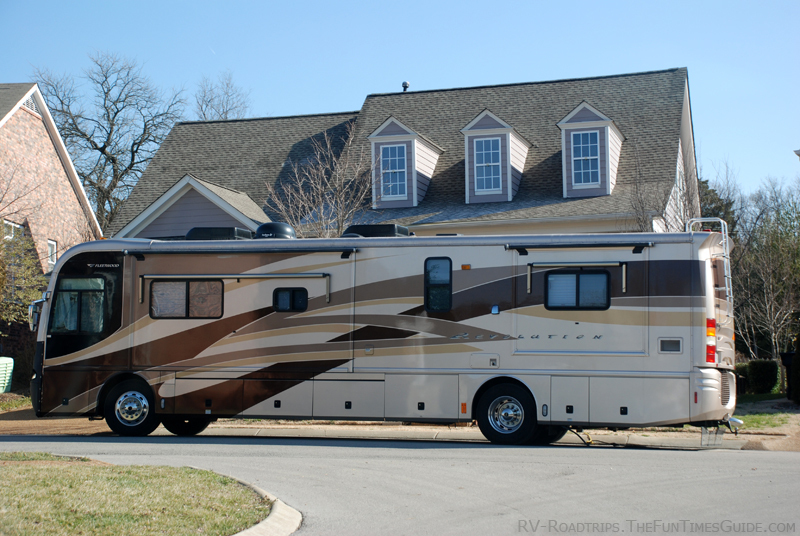 One thing’s for sure… driving a Class A motorhome can be intimidating. But it’s a skill that can be easily learned — with a little practice. I’m here to tell you every truck driver, fireman, and construction worker had a first time, too. Everyone who is currently on the road in a large vehicle had a first time behind the wheel, too. And yet they’ve all apparently mastered the skill. The first issue you need to address is driver comfort. Sit down in the driver’s seat and take the time to adjust it properly so that you can comfortably reach all controls, and pedals. Not only does the seat need to be forward and backward to the correct location, but up & down and tilt are just as important for long distance comfort. Today’s seats adjust about 6 different ways, so try to make full use of the seat’s capabilities. Next is mirror adjustment. The standard rearview mirror on the windshield (if there even is one) will be pretty useless except for determining if your passengers are walking around or sitting down. Side mirrors on both sides of the RV are your main source of outside information rearward. Here’s how to adjust RV mirrors. As an option, some motorhomes will have rear vision cameras, giving you a clearer picture of what’s happening behind you. This takes all the guesswork out of what’s going on as close as a couple feet from your rear bumper — a spot you can’t see with side mirrors. Driving a motorhome gives you a view of the road like no other vehicle does. The big picture-window windshield broadens your range of vision, and the high front seats place you higher than regular automobile traffic. When you can see well ahead, then you have more time to avoid road hazards and can more easily gauge the traffic ahead. Today’s motorhomes drive as easily as any car on the road. Automatic transmissions, power steering, and power brakes are just like your car, except the refrigerator is close by. The only real difference is the size of the vehicle and the amount of room needed to maneuver such a big rig in, through, over, and around various spaces. For example, to navigate corners, you will have to swing out to some degree, in order to give the rear half enough room to clear the corner. If you turn the wheel immediately when you reach the corner, you will find yourself running over curbs, road signs, pedestrians and small dogs. By swinging out and going further into the intersection before turning, you will avoid the insurance claims required to answer for all the damage. Realizing that you’re the biggest thing around will help you avoid such places as narrow alleyways, parallel parking, and low parking ramps. Keep in mind: The far end of Walmart’s parking lot always has plenty of space. And, if you’re anything like me, you’ll find the extra walking will do the body good. For the most part, just take your time and try to not put yourself into a place that will require you to maneuver in ways you’re not confident with. Keep it between the lines. Here’s a great tip: On the freeway, don’t concentrate on the middle line, or the white line on the side of the lane. Instead, by just looking ahead about 4 or 5 car lengths, you will naturally gravitate toward the center of your lane. In no time, you’ll be zipping along with the best of them. Semi trucks have nothing on you, except weight. You may be at similar eye level, but the wind suction when a semi truck passes may still be enough to pull you toward them. Being aware of this frequent occurrence wiil enable you to make slight corrections, as necessary. 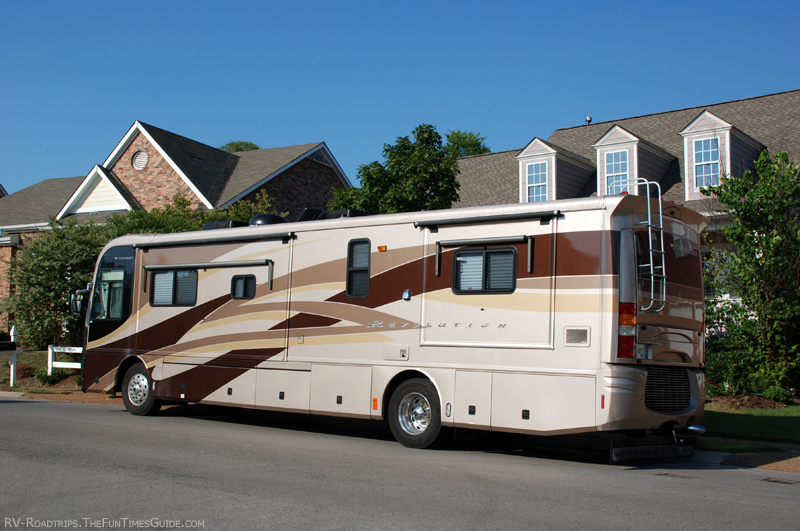 The amount of correction varies, based on the weight of your motorhome (and how much weight you’re carrying). The best way to sharpen your skills in a hurry is to find yourself a big empty parking lot, take some simple markers (like old magazines), "create" a parking space, and practice pulling into it (frontwards) and backing into it (from 90 degrees). By imitating backing into a driveway you’ll be able to do it smoothly when the need arises and you’re forced to get yourself out of a tight spot. The most important thing to remember during your first days behind the wheel of a motorhome is to go slow and build your confidence one step at a time. When the time comes to back up into unfamiliar surroundings… be sure and be safe! If it means getting out of the driver’s seat numerous times to walk back and verify that you’re not going to hit something, just do it. Insurance claims are a hassle that you’ll want to avoid.